Limited edition indies exclusive green vinyl. 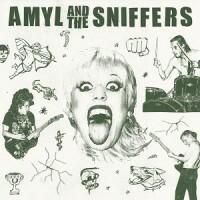 The debut album from Amyl and the Sniffers is the sound of 21st century Australia recored in Sheffield with producer Ross Orton. It's primal and explosive with a love of glam, the 70's Sharpie movement and good time rock n roll backed with lyrics that somehow are simultaneously bleak and nihilistic, yet humorous and celebratory. The album is full of beefy riffs and stomping drums that rages and rolls and lives up to all the hype. It has attitude, sass and Amy's sore throat howl.